Are you ordering new baby chicks this year? 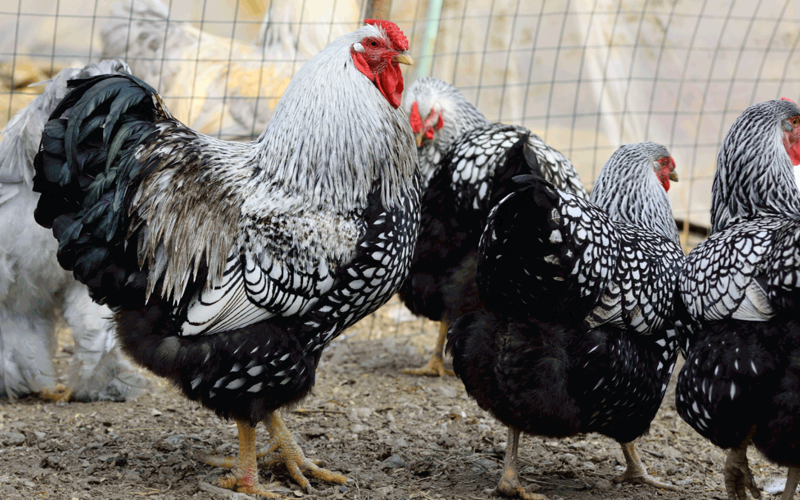 Whether you’re wanting fresh eggs, showing birds, or just expanding your flock, you should consider adding a rooster to your flock if your local ordinances allow. Roosters, also called cockerels, are often overlooked or re-homed, especially by those only interested in fresh eggs. But there are several benefits to having a rooster — in addition to their bold, striking features and colors — that might just change your mind. Flocks with roosters have a better social order and tend to have happier hens. Roosters will keep order in the flock, forage and locate food for their hens, protect their flock, and even help them to find locations to lay their eggs. While some may select to have a flock without a rooster due to its noise and aggressive behavior, it is important to note that hens can be just as aggressive. In the absence of a rooster, one of the hens will naturally take on the role of the rooster and the leader of the flock. Roosters are born with a natural instinct to protect their flock. These guardians of the flock are more alert than their hens, always on alert and taking a high position to scan the skies and surroundings for predators. Their crowing warns their flock of any dangers. Having a rooster can lead to happier hens. They will forage and locate food and call to their hens to alert them it’s time to eat, then they stand guard while the flock eats. Another benefit of having a rooster is having fertilized eggs. One rooster can keep as many as twelve hens’ eggs fertilized. These eggs are still edible, and are great for those looking to raise more generations of chickens for food or just expand their flock naturally. Many breeds of roosters make good meat birds. They mature more quickly than some breeds of hens, and their larger size makes them desirable for roasting. Take a look at our Cockerel Assortments when looking for a mix of meat birds. For those interested in showing their birds, roosters not only showcase their breed’s features, but it’s necessary to show both the male and female in some competitions. Take note of the rules for entering before ordering your chicks, as many require a trio or a complete set of hens and cockerels. As you plan your flock this year, consider the benefits of adding roosters to your order. A flock of 25 birds can have up to five males. For questions when placing an order, contact our offices at 800.456.3280.